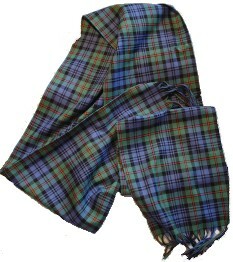 This is the McKinlay tartan. It has a confused history and has ancient and modern versions. I prefer the ancient version (pic). The tartan has been described as Black Watch with red, except that whereas the Black Watch has a narrow stripe of black centered on the green bands, the Mackinlay/McKinlay has a narrow red bordered by two narrow black lines. I might wear a kilt on occasion, but I don’t own one and importing tartan is ridiculously expensive. So I make do with a sash.